When divine rights collide, Richard's theological doctrine doesn't have a prayer against the nobles' primal dogma of greed. 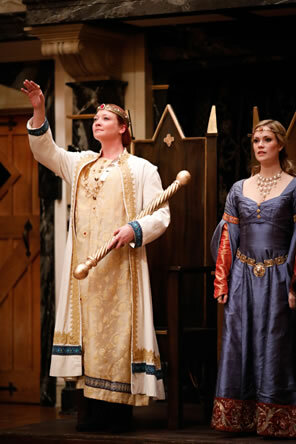 Richard II (Sarah Fallon, left), arrives at court as his queen, Isabel (Lauren Ballard) looks on in the American Shakespeare Center production of William Shakespeare's Richard II. Photo by Lindsey Walters, American Shakespeare Center. My intention was to give little attention to the fact that a woman is playing the title role in the American Shakespeare Center's (ASC) production of William Shakespeare's Richard II. Then, Richard himself brings it up. In the play's penultimate scene, Richard, alone in his prison cell and with no one to talk to, divides himself to "hammer out" his contemplations. "My brain I'll prove the female to my soul, my soul the father, and these two beget a generation of still-breeding thoughts," he says. Note that Shakespeare assigns the brain to the female. 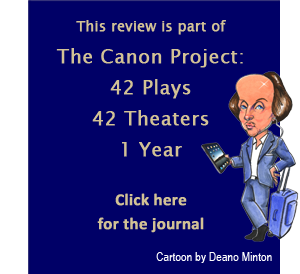 Casting a woman as Richard II is not a novel idea. The tradition follows a line of critical thinking that sees this particular king as an effeminate and weak tragic hero. Richard's line about his female brain perhaps seals that thinking. I don't necessarily equate feminine with weakness, and I certainly don't equate Sarah Fallon, playing Richard in this ASC production, with weakness. I do regard her—at the risk of sounding indelicate or sexist—as all woman. Since I first took special note of her playing Helena in a 2004 ASC production of A Midsummer Night's Dream, my brain has built a compartment dedicated to the indelible memories of Fallon performances at the ASC's Blackfriars Playhouse, the world's only re-creation of Shakespeare's indoor theater. She played Dido, the most beautiful woman in the world, in Christopher Marlowe's play. She portrayed Cleopatra exactly as Enobarbus describes her. Her Lady Macbeth was the truest portrayal of the role I've ever seen. She famously played all four iterations of Queen Margaret in Shakespeare's Henry VI tetralogy over four years (one part produced per year, concluding with Richard III). Her iconic pairings with René Thornton Jr. in several plays (from Tamora and Aaron in Titus Andronicus to Beatrice and Benedick in Much Ado About Nothing) include Fallon as Cassius to Thornton's Brutus in Julius Caesar. That last example is instructive to her playing Richard. Fallon playing Cassius wasn't stunt casting: it was all about chemistry with Thornton's Brutus. Similarly, in a company that regularly employs cross-gender casting, Fallon as Richard is obvious. I've long considered Richard II to be a perfect character for Fallon to play because of her expertise with Shakespeare's verse (Richard is one of his most poetical characters), her second-nature sense of regal bearing, and her ability to play inner strength and psychological disintegration even in the same moment, as Richard displays in the deposition scene at the play's center. What's novel about casting this particular woman as Richard is that former ASC Artistic Director Jim Warren was confident she would not play the king as weak or effeminate. Of course she wouldn't. I've seen Fallon effectively lead armies, torture dukes, go toe-to-toe with Richard III, beat up messengers, psychologically castrate Scotland's greatest warrior, and physically castrate a king in Beaumont and Fletcher's The Maid's Tragedy, all while playing women; and I've seen her form an assassination plot while playing a man. Sure, Richard is spoiled, loves flattery, is an inefficient governor, and is not politically astute. But he keeps a firm grip on his core ethic—divine right—even if this moral anchor is what sinks him. Plus, in the final scene, he kills two of the murderers before the gang finally overpowers him. That moral mettle and dangerous temperament runs through Fallon's performance from the start. Her Richard's thematic towline is how much he loves pomp. In jewel-trimmed white robe and blue boots, she enters at the play's start like a walking statue, head tilted back so that her gaze is higher than that of common folk, scepter cradled in one arm, her other arm extended in a Nazi-like salute. She circles the stage and sits on her throne with a palpable sense of divine right, stiff in manner, speech, and gesture; Fallon even turns her normally sensual eyes into portals of serious formality. At the point when Richard's fall is inevitable, Fallon still retains an image of high majesty, appearing on the ramparts of Flint Castle "as doth the blushing discontented sun from out the fiery portal of the east, when he perceives the envious clouds are bent to dim his glory and to stain the tract of his bright passage to the occident." Henry Bullingbrook (David Anthony Lewis) speaks these lines, the very man besetting the king with rebellion. The Duke of York (John Harrell) appends Bullingbrook's comment: "Yet looks he like a king. Behold, his eye, as bright as is the eagle's, lightens forth controlling majesty," and Lewis's Bullingbrook vocalizes agreement. Fallon takes these lines as her stage direction, maintaining this image throughout her "We are amazed" speech. A verbal echo to these visual images comes at the crux of Richard's deposition scene. After fits and starts, Richard "will undo" himself as king, and Fallon starts by formally removing the crown. "I give this heavy weight from off my head, and this unwieldy scepter from my hand, the pride of kingly sway from out my heart." Fallon's Richard continues steadily through a litany of unkinging acts and gets to "with mine own breath release all duty's rites," when she unexpectedly pauses and nearly chokes on the next phrase: "All pomp and majesty I do forswear." Pomp and majesty are all that Richard has known. His father, the famous warrior Black Prince, predeceased Edward III, and when that king died, grandson Richard was crowned at 10 years old. Despite his title, Richard as an adult historically had to wrest power from the hands of his powerful uncles who served as regents for the kingdom. These political battles, which included the apparent murder of his uncle Thomas of Woodstock, Duke of Gloucester, underlie the opening scenes in which Bullingbrook, son of one of those uncles, John of Gaunt (Christopher Seiler), Duke of Lancaster, accuses Thomas Mowbray (Josh Innerst) of treasonous acts, including Gloucester's murder, a charge that pokes at King Richard. Fallon's Richard has a firm grip on his state in these opening scenes, but everybody seems to be dismissing the majesty he believes is owed him. Mowbray won't relent to Richard's order to give up Bullingbrook's challenge gage, and Bullingbrook certainly won't give in. "We were not born to sue, but to command," Fallon's Richard blurts in frustration before setting a date for their combat. In that combat, however, the king intervenes and sentences both to banishment. This commanding nature ironically is undermined when he shows kindness by lopping four years off Henry's 10-year banishment for the sake of Bullingbrook's tearful father. Gaunt, though, doesn't much appreciate even six years' banishment, and his reaction sparks frustration in Fallon's eyes. That frustration ignites into anger as Gaunt, though nearing his death, later lectures Richard about his poor governance. After Gaunt dies and Richard confiscates the estate, his lone living uncle, the Duke of York, then argues against the king's decree. Fallon's Richard looks on in astonishment—he just can't get a divine right break around here—and then adds a steel-sharp edge to his voice in reiterating his decree: "Think what you will, we seize into our hands his plate, his goods, his money, and his lands" (Richard's entourage, Bushy, Bagot, and Green, already is carrying out some of that plate and goods). What Richard fails to grasp is that "divine right" cuts both ways. Upon his premature return to England to claim his rights as Gaunt's heir, Bullingbrook complains to York, "Wherefore was I born? If my cousin king be King of England, it must be granted I am Duke of Lancaster." Critics and scholars have long debated whether Bullingbrook is aiming to usurp Richard all along, but Lewis keeps Bullingbrook's motives tightly guarded, even after Richard is in his custody. "Cousin, I am too young to be your father, though you are old enough to be my heir," Richard tells Bullingbrook at Flint Castle. "What you will have, I'll give, and willing too." Lewis's Bullingbrook is taken aback to hear this, the crown essentially being handed to him. Earlier in the scene when he learns that Richard is in the castle, Bullingbrook sends Northumberland (Tim Sailer in a fine performance of political practicality and little ceremony) as his emissary to offer King Richard "allegiance and true faith of heart … Provided that my banishment repealed and lands restored again be freely granted." Much import in that provided. Perhaps Bullingbrook is not aiming for the crown, but he certainly puts his own divine right ahead of Richard's. When divine rights collide, Richard's theological doctrine doesn't have a prayer against the nobles' primal dogma of greed. Richard's royal estate and his psychological state are so intertwined that as the former disintegrates, the latter deteriorates. Fallon gives a wrenching reading of Richard's psychological surrender: "For heaven's sake let us sit upon the ground and tell sad stories of the death of kings." Watching this king discover that he is as human as everybody else—indeed, he is less than human because with no title in his mind he is no one—is devastating, no matter how petulant we might think him earlier in the play. It is then that he becomes a true tragic hero. His divine right gone, Richard grips hard to the resulting vacuum in his personhood and wields it as a moral weapon against Bullingbrook in the deposition scene. Fallon wears a simple white robe for this scene, and in the Pomfret prison for Richard's last scene she is wearing a veritable burlap sack. No pomp, but her Richard still has a sense of majesty. Despite Fallon's expected triumph in the title role, the most notable aspect of this Richard II is its ensemble quality, which stands out because this is an Actors' Renaissance Season production: the 12 actors stage the play with a week's worth of rehearsals without a director or production team and using only cue scripts comprising the actors' parts plus a line or two before they speak. It's one thing to speak their roles well, as most do; it's another to play their parts so acutely when they are not speaking. During the opening scene, Richard's entourage, Bushy (Chris Johnston), Bagot (Benjamin Reed), and Green (Jessika Williams), lounges at the back of the stage, smirking and nudging each other in appreciation of the testosterone throw-down they are witnessing: you half expect them to break out with "Fight! Fight! Tommy and Harry are having a fight!" Richard may maintain a strict decorum of formality, but his entourage doesn't: Reed's Bagot leans against Richard's throne, his legs crossed and one arm hanging over the chair's carved back, a visual metaphor of the "disorder'd" garden of Richard's government. Top, Henry Bullingbrook (David Anthony Lewis) keeps his motives tightly guarded as he eventually ends up deposing Richard in the American Shakespeare Center's Actors' Renaissance Season production of William Shakespeare's Richard II at the Blackfriars Playhouse. 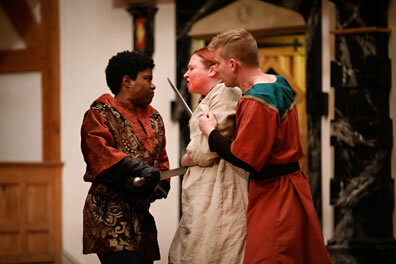 Above, Exton (Shunté Lofton, left) with help from another murderer (Benjamin Reed) applies the fatal thrust on Richard (Sarah Fallon) after the deposted king has managed to kill two other members of Exton's murdering crew. 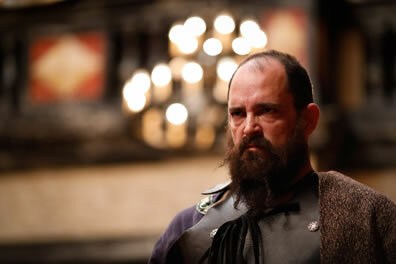 Photos by Lindsey Walters, American Shakespeare Center. Williams also takes the part of Scroop delivering a string of bad news to Richard upon his return from Ireland. It's hard to keep your eyes off Fallon in this scene, but sneak a peek at Williams's Scroop fretting the inevitability that he has much more and worse news to tell. Williams scores a nice moment as the Gardener, too, tending to a bank of red and white roses (what served as theater trimmings for the Henry VI productions the past three years provides a thematically prophetic choice for a prop). She subtly weeds her own versions of "Bushy" and "Green" in the garden. In yet another highlight performance, Williams plays the Duchess of York and teams with Harrell's York and Allie Babich as Aumerle, their son, when the three beg to cross-purposes before the newly crowned Henry IV. In lesser hands and tongues (and knees), this scene of rhyming couplets can seem stilted stupidity, but here it has all the dynamics of a great Saturday Night Live skit. Harrell foregoes the doddering foolishness I've usually seen in portrayals of York and speaks his lines with a virile, baritone authority despite the fact he has no real power, even when he's serving as regent while Richard is fighting a war in Ireland. "Tut, tut!" he declaims at Bullingbrook's fomenting rebellion: "Grace me no grace, nor uncle me no uncle," Harrell says, combining gravitas and comedy in his delivery. He also has the kind of metatheater moment that so often emerges in text-centric Blackfriars productions. Describing to his wife the procession of the triumphant Bullingbrook and the deposed Richard through London, York says, "As in a theater, the eyes of men, after a well-graced actor leaves the stage, are idly bent on him that enters next, thinking his prattle to be tedious." Harrell's gesture clearly indicates he considers himself that "well-graced actor," earning a knowing laugh—knowing because we consider this veteran Blackfriars player such a well-graced actor. Pity the poor player who must enter next; that would be Babich as Aumerle. Except that Babich's Aumerle is another highlight of this production. She portrays York's son as sporting a barely-beyond-peach-fuzz mustache and learning the nuances of courtly manners, political backstabbing, and brown-nosing the powerful. Aumerle is at the center of the gage-throwing lords in Parliament, a scene of Shakespearean craftsmanship at its best. The play's dramatic climax (Richard's deposition) is put on hold as what begins as more courtly pageantry turns into a comic set piece of nobles and knights accusing each other of treason and challenging each other to combat. A total of six gages (gloves) are slammed to the floor, and Aumerle has to borrow a gage because he's already deployed his pair: Williams playing Surrey tosses one of her gloves to Babich who catches it and spikes it to the floor in one motion. Some productions cut this scene, which I proclaim is high treason against Shakespeare's comic brilliance. While these actors, in charge of their own show, are obviously having fun staging it, this scene further demonstrates their collaborative spirit, creating as fine-tuned an ensemble as you could hope to form in months of rehearsal, let alone a mere week. Did I mention that women are playing half of these guys? No? Well, it doesn't matter. Richard might divide himself into a female brain and a father's soul, but the ASC Actors' Renaissance Season company is a cohesive ensemble of actors in which talent and teamwork are all that matters.